All in all, the HP LaserJet CM2320n is a good small business multifunction printer. It has speeds up to 21 pages per minute with the first page out in 17.8 seconds. Most of the problems we have run into have been the results of owners not reading specifications before buying or they have not properly installed the printer. An example would be owners that use Windows 7, the drivers for Windows 7 must be downloaded from HP’s website, if you want the printer to work properly. The specifications do not mention compatibility with Windows 7. We hear a lot of complaints about the expense of printing especially from customers that have switched from a monochrome printer to color. Sorry guys/ gals color printing is more expensive than just printing with black, that is the nature of any color printer. Some helpful tips would be to buy dual packs on the black toner and switching to aftermarket toner, from a reputable dealer. You must remember the industry specifications, for page saturation, are based on 5% coverage, which is like an 8 line business letter. Most people with a color printer will print pictures, which the page saturation will be much higher, usually around 75 to 95%. 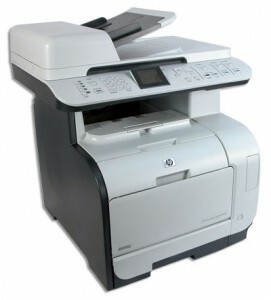 Toner then will empty much faster than with a monochrome printer and therefore cost more. This printer does have some issues with paper curl but that will vary from machine to machine. And it does have some issues with repeating horizontal bands – they can be intermittent or on every page: our best guess is that this is caused by bad toner cartridges and when this happens save a sample to return with the cartridge to the dealer for replacement.